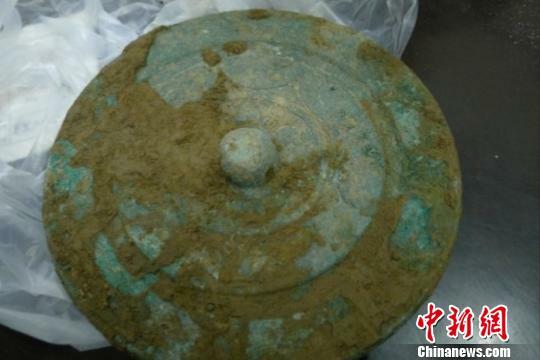 CHINE – Fanjiazhai - A tomb dating back about 2,000 years was found along with 20 relics in Fengxiang county, Shaanxi province, the county's heritage and tourism bureau told China Daily on Tuesday. 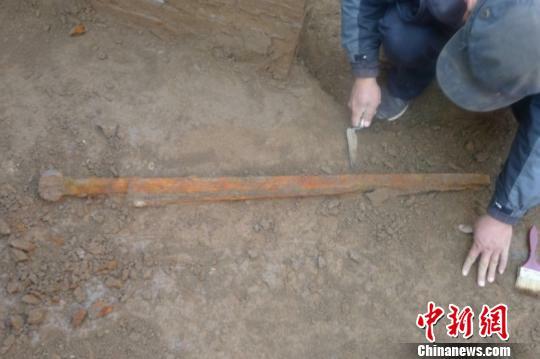 The tomb, located in the county's Fanjiazhai village, was discovered during a railway construction project. The site, which is buried 7 meters deep, is divided into four rooms and contains weapons, pottery, copper coins and a bronze mirror. 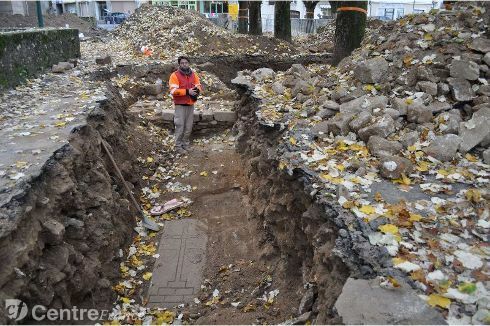 Although the coffins and skeletons have been destroyed, archaeologists believe that the tomb was built for a general in the Western Han Dynasty (206 BC-24 AD) due to the building characteristics and objects found. 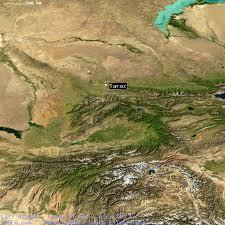 KAZAKHSTAN – Taraz - A Taraz archaeological dig will be expanded, officials have decided. Zhambyl Oblast Governor (Akim) Kanat Bozumbayev November 20 discussed the dig with its director, Prof. Karl Baipakov. Baipakov, director of the Institute of Archaeology of the Kazakhstani Academy of Sciences, showed Bozumbayev satellite photos that proved the boundaries of the ancient Taraz settlement his team is working on were far greater than originally thought. For example, archaeologists now know a Zoroastrian cemetery lies under present-day Dostyk Square. Baipakov’s team expects to find relics from three eras – the early Turkic period (6th-8th centuries), the 10th-12th centuries and the Kokand Khanate (18th century). INDE – Charaideo - The head of directorate of archaeology, Assam, HN Dutta, has said the iconic Ahom monument in Charaideo has the potential to be included under Unesco's World Heritage Site in the historic monument category. 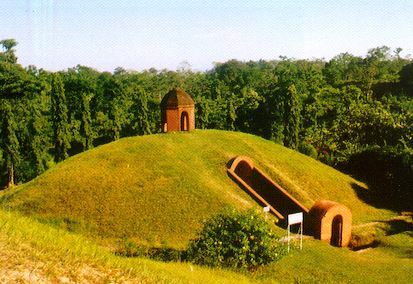 The iconic Ahom monument, which is located in a burial site, is in Sivasagar district. The World Heritage Week, which is underway at the Ambari Archaeological site, was inaugurated on Monday by HN Dutta with an exhibition on the achievement and works of archaeology in the past years. The event was specially aimed at the student community to teach them to respect local tradition and culture. "We have two world heritage sites in Assam but we have no monument under the Unesco World Heritage Category. Charaideo has all the potential to be a nominee in the list. It is rare monument that encompasses traits on the lines of a Buddhist stupa, both religiously and architecturally," said Dutta. 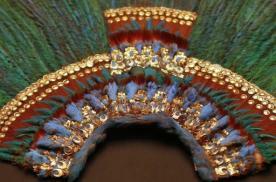 MEXIQUE – Steeped in myth and legend, the "Penacho", a feather headdress supposedly worn by Aztec emperor Moctezuma II, continues to stir up passion in Austria and Mexico as it goes on display again after a years-long restoration. Some say it was brought to Europe by Spanish conquistador Hernan Cortes, others that it was used by an Aztec high priest. In any case, the vibrant green-and-blue headpiece -- the only one of its kind still in existence -- remains at the centre of a tug-of-war between Mexico, which wants to bring it home, and Austria, which argues it is too fragile to be transported. 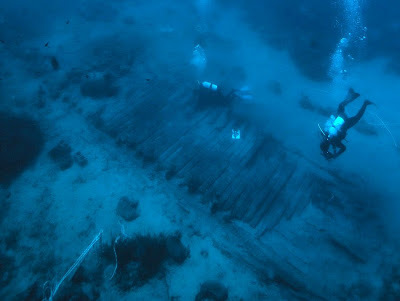 GRECE – Kythera - The underwater shipwreck excavation of the wreck of the ship Mentor, that sank off the island of Kythera in 1802 while carrying goods plundered from the Parthenon by British diplomat Lord Elgin has proved to be a treasure trove of personal items from the passengers and crew. A greater number of coins were also found, at least two ancient silver coins which were antiquities acquired by Elgin, passengers or the crew,along with two gold coins, used as currency at the time, from the late 1700’s. Other coins were also recovered but require conservation before they can be identified. Some of these may also be ancient. Finding three ancient coins on the wreck last year created international news, prompting a question about what other antiquities Elgin was transporting, in addition to crates of Parthenon marbles and sculptures. There may be even more questions from this year’s finds, after conservation of currently unidentified coins is completed. Another pistol was recovered, a fob (pocket) watch, personal seal with a cannon on it and gold chain, a pipe, ring, part of navigation instruments, bottles, musket balls, cannon balls, crockery and ceramics possibly from the galley (kitchen) area. The Mentor was a small Brig, carrying 16 crates of Parthenon sculptures and a marble throne, en-route to Malta and then the United Kingdom. Diaries from the time reveal that the Parthenon sculptures and marble throne were recovered by sponge divers from Simi and Kalymnos in 1802-1804 but it’s unknown what else remains buried on the bottom of the sea, near Avlemonas.